Will Davis - Copyright 2010. 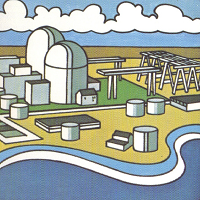 Nuclear energy news, insight and analysis. Coverage of events world wide, including new plant construction, operation of plants now in service, and shutdown and decommissioning of plants. 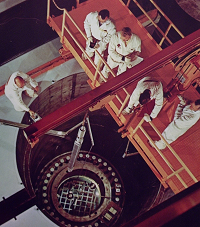 APR emphasizes the technology of nuclear energy, as well as the history of the development of that technology. Your #1 nuclear energy source! 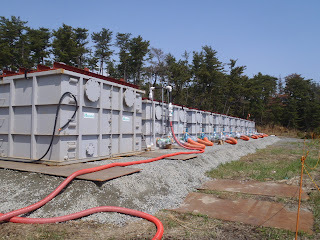 TEPCO is rapidly running out of room for contaminated water, due partly to water injection and partly to rain at the site. 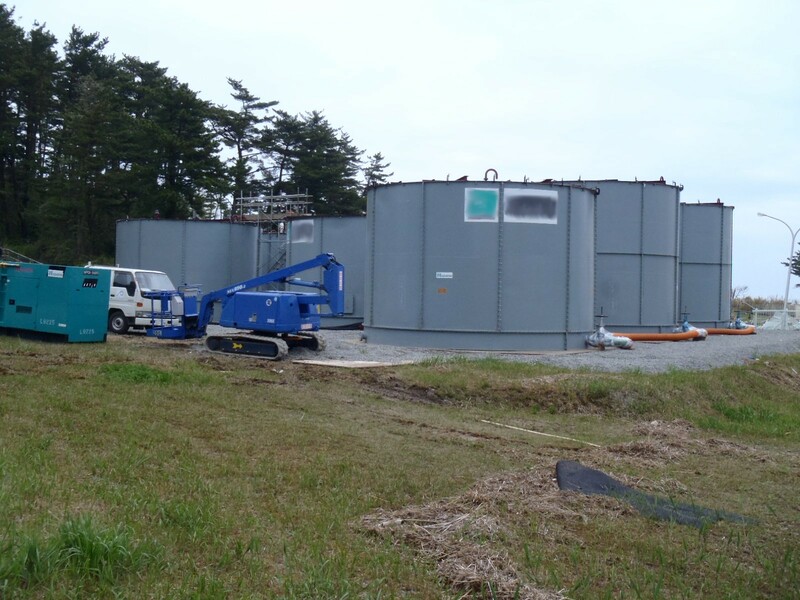 The company has announced that beginning tomorrow it will begin shipping two sizes of tanks (100 and 120 cubic meters in volume) from Tamada Kogyo Corporation's plant in Tochigi Prefecture to the Fukushima Daiichi site for installation. These will supplement all the other tanks being installed on site, and the "mega float" now firmly secured to the pier at the site. The company expects most of the shipments to be performed at night, and expects about six of the large units per day to be shipped from now until early July, and four units per day of the smaller size from the middle of June through the middle of August. This will vastly increase the capacity for contaminated and then later for cleaned-up water on site. NHK is carrying the line that TEPCO has reported having as much as 105,000 tons of contaminated water on site right now, in all of the various affected and damaged buildings, and tunnels and installed tanks as well as the rad waste building. Filtration equipment may be on line as early as June 15. 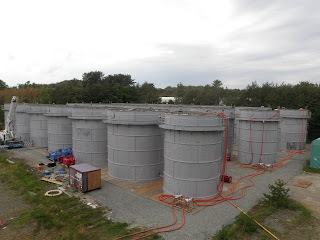 Below, some of the temporary tanks installed near Units 5 and 6 in a TEPCO release. And some further... and much larger (click to expand) TEPCO press photos showing the interlinked tank setups. Note that these are NOT the same as the tanks mentioned in the opening paragraph of this post. These are the previously designed tanks for temporary storage, and the tanks now ordered will vastly exceed these in total capacity later on when fully installed. Water injection (all feed line injection) to No. 1 and No. 2 plants stands at about 5 cubic meters per hour, both, and both have feed nozzle temperatures right at about 110C. No. 3 plant's injection rate is 11.5 cubic meters per hour with a feed nozzle temperature of 150C. TEPCO, no longer believing the previous reactor vessel pressure indication, has installed a temporary gauge at No. 1 plant which will be viewed remotely by a temporary television camera. TEPCO has noted for some time, apparently, that feed pump discharge pressure was widely disparate from the indicated instrument pressure and has made this move to correctly determine the value. TEPCO's press release (handout) indicates this work will also be performed identically at the other two reactors affected. There is a small flap going on among various entities in Japan over cylinder liner failures in some EDG's. 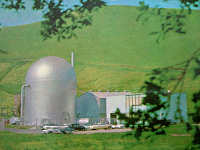 One at the fast breeder Monju plant has been found with failed liners, and investigation has shown that liners of certain original vintage (made Feb '87 through May '89) may have excessive lead content and thus be weak... although a note was made about jacking the liners without adequate monitoring leading to excessive forcing. As far as TEPCO is concerned, only Fukushima Daini No. 2 and No. 4 plants have similar diesels with similar liners, so that the problem appears not to be wide spread. 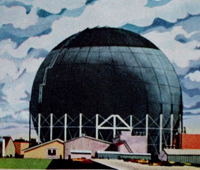 Energy Steel & Supply Co. Using Nuclear Power Instead Of Coal Has Prevented 2,123,000 Premature Deaths. Cumbria Nuclear News & Views - The end! Blurry water tuned clear, the dust settled and distress about the personal threats gone with the wind. 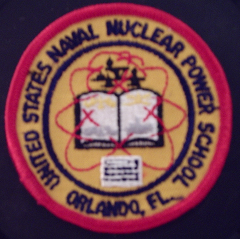 Nuclear fear mongers never die. They just decay into obscurity. kirstygogan | Re-articulating the energy and climate debate. Fission vs. Fusion – What’s the Difference? This blog © WILL DAVIS. Reproduction permitted only with credit.